So, you've decided be a charcoal grill person. You put in the work: found the perfect grill for you, swore off lighter fluid, and figured out how to maintain it. Great job, adult! Now it's time to learn how to cook on that sucker. For advice on how to cook pretty much everything (well, not EVERYthing, but you get it), we could have asked any number of dads. But then we remembered a long lineage of burned burgers and dry chicken and decided to hit up Meathead Goldwyn, certified BBQ whisperer and bestselling author of Meathead: The Science of Great Barbecue and Grilling, one of the all-time best grilling books ever written. He offered up techniques, tips, and one admittedly, um, unexpected method for keeping your fish flaky. Most of us learn to grill from our parents. And most of our parents learned from their parents. And for most of that charcoal-stained lineage, they’ve been doing it wrong. 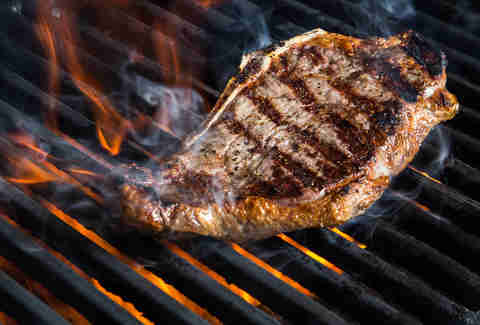 "All the old rules about searing (your meat) first are wrong. And ‘put the meat down and don’t flip it’ is wrong,” says Meathead. According to the bestselling author, there are three essentials of charcoal grilling. The first is establishing a two-zone system, wherein the coals are divided up at the base of the grill, creating one cooler zone for convection heating (basically turning your charcoal grill into an oven) and an ultra-hot zone for fast cooking and searing. The second is using a digital thermometer, which are cheap and can ensure you’re not overcooking. The third is mastering the reverse sear. That's going to require some explanation. Essentially, reverse searing bucks convention by embracing convection. Using the two-zone system, you start cooking the meat on the cooler side to ensure it heats up evenly. Then, at the last minute, you finish it on the hot side. It’s the exact opposite of what people have been doing for centuries. And it's what Meathead recommends for pretty much any cut of meat thicker than an inch, be it beef, poultry, goat, lamb, or anything else (see, we didn't lie with that headline). “It’s what I call redneck sous vide,” says Meathead. “Contrary to everything you’ve been told, you start cooking on the indirect, cool zone, not in the hot zone. You gently warm the meat… on the indirect side, it’s convection, warm air. There’s not a lot of energy in warm air. But when you move it over the coals, you’re exposing it to infrared radiation. It’s like putting it under the broiler." To further fly in the face of tradition, Meathead says you should be flipping the meat regularly on the high heat in order to brown it evenly. It’s not as complicated as it sounds. For a more detailed look at how to master it, check out this guide from Meathead himself. 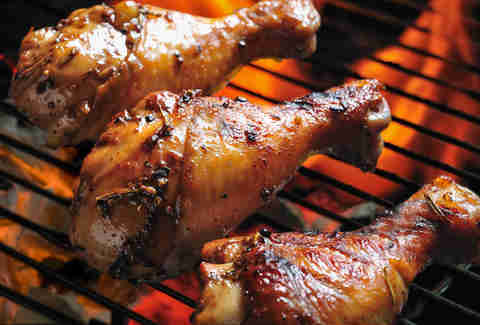 BBQ chicken is a staple of grilling. It’s also often a tragedy. Because a fear of undercooked chicken is as engrained in humans as fear of clowns and commitment, wannabe grillmasters tend to throw poultry on high heat until the pieces are bone dry. Weirdly, the skin stays flappy and gross. The reverse sear method Meathead preaches helps solve those problems and makes the skin a star rather than a peel-away afterthought. Another sin is the giving in to the temptation to cut the chicken to see if it’s done. Taking the presence of pink juices to mean a bird’s undercooked is another age-old bit of misinformation. Still, you don’t want to mess around when it comes to chicken. Using a thermometer here is essential both in safety and avoiding cutting it open for no reason, thereby drying out the interior. 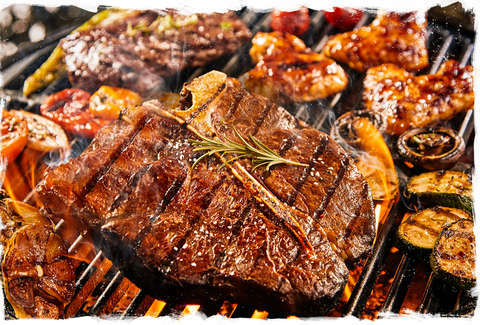 The desired temperature of a steak changes from eater to eater. The combination of a thermometer and reverse searing can help ensure that the internal temperature is consistent and accurate. But to really nail it, you have to transfer it over to the high heat zone at the right time, generally when the steak is about 10 degrees from the target temp. 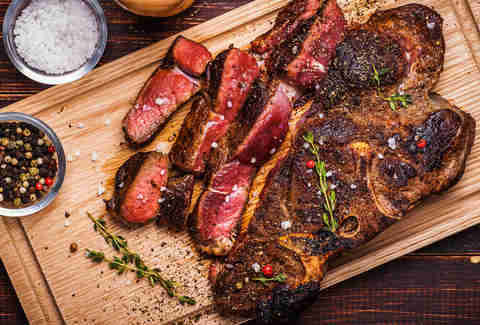 “Let’s say we’re going for a steak, and 130 degrees is ideal medium rare, you’re going to take it up to about 120 degrees using your digital thermometer, then move it directly over the coals,” Meathead says. 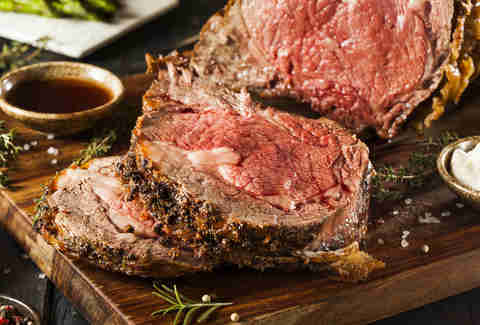 But given the disparity between cuts of beef, Meathead emphasizes that the reverse-sear should be reserved for cuts that are 1in thick or bigger. 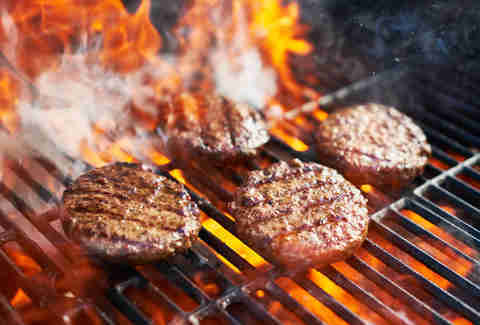 Burgers are one of the most common cookout casualties, largely because there is so much conflicting wisdom about how to work with them. If they’re thin, cook them over high heat relatively quickly. If they’re thick, go low heat and finish off over the coals. Then get them the hell off the grill. Then there’s the meatball effect: The tendency for a thick burger to suddenly ball up into a thick, uneven globe once it hits the heat... well, once it hits the high heat. There's a scientific reason that happens. Salt can also throw a burger’s physical properties into disarray when mixed into the meat. Other spices massaged into a burger pre-cooking are fine, but salt should only be sprinkled atop a burger, not mixed in. People are terrified of undercooked brats, viewing them as tubes of pestilence and famine. They compensate by going nuclear on them and serving them as gross, charred logs. It’s a travesty. High heat is actually a brat’s enemy, since it chars the outside while hiding an undercooked inside. 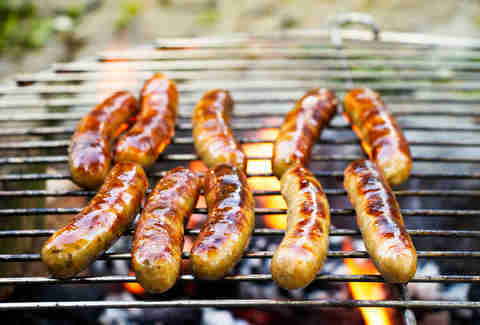 On charcoal, brats should be relegated to the cooler side of the grill, or the outside rim. And if you really want to maximize the flavor, opt for a digital thermometer. It might make the grill look like a urology-based horror movie on SyFy, but it will result in the best brats you can serve. If your cut is thicker than an inch, reverse sear that hog. For smaller cuts like chops, you’re good to go high heat. 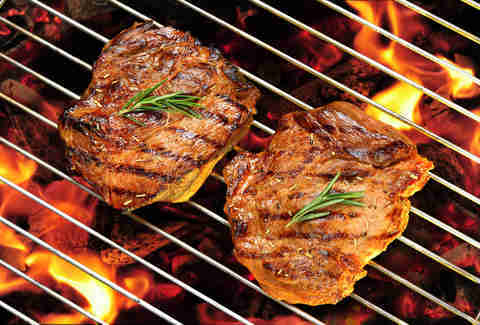 Basically treat chops and pork steaks like a beef steak when grilling on charcoal. That, surprisingly, applies to the temp. The long-held belief that pink, juicy pork is a deadly indulgence has been proven false (the USDA even reduced the suggested temperature to 145 degrees. But you can go lower. And it can change the way you view pork. Once you master a charcoal grill, you have more control over the temp than you'd actually believe (check out Meathead's advice on temp control here). You can basically turn the thing into an oven. If you have time, that means you can make a masterful roast with way more flavor and texture than you can in a regular oven. Inevitably, you're going to have to grill a vegetable. It's just part of being an adult. 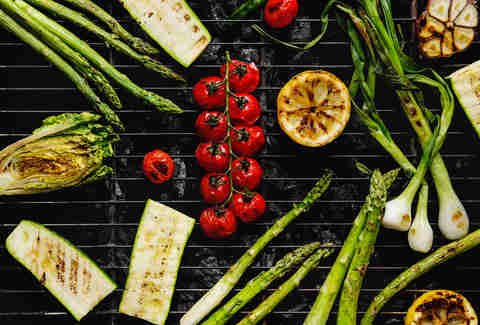 And while all veggies are different, most should all be prepared over the hot coals and splashed with a little oil to keep them from shriveling. There's also the issue of thinner-sliced veggies or sprigs of asparagus falling through the grates. Some folks opt to throw a cookie cooling rack on the grill. Meathead says to just expect a little collateral damage, but to make sure that you lay things out perpendicular to the openings in the grill. “You have to go across the grates. Asparagus... there’s always one guy who commits suicide and falls through the grate," he says. You can grill pretty much any sort of seafood, and getting into all of them would make this article waaay too long (here's a handy guide, courtesy of celebrity chef Seamus Mullen). Rest assured that lobster is delicious halved and grilled, and that clams are great with a little smoke. Fish, too, are all over the board for both texture and flavor. But generally, you can expect them to be flaky. Meathead recommends setting them on the cooler side of the grill and eyeballing them for flakiness. 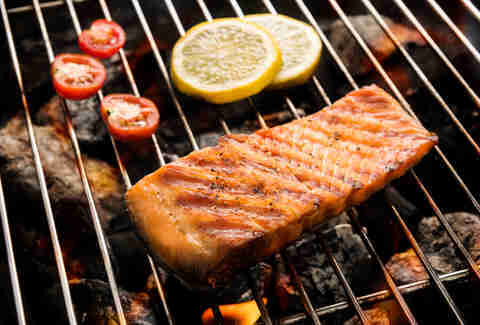 Some folks use wooden planks for a little flavor (think cedar plank salmon), though what you're basically doing is preventing the heat from the grill from getting on the wood and using hot air to cook the fish. Putting the fish directly on the grill is a great way to get a ton of flavor out of a filet or steak, but given the flakiness of the meat, it also tends to stick directly to the grill, leaving a shredded carcass where your delicious meat once existed. Meathead has found a solution, one that admittedly needs to be sold pretty hard. But he swears by it. Honestly, at this point we're prone to follow Meathead down any hickory-scented rabbit hole. Bring on the sandwich spread. Andy Kryza is a senior editor at Thrillist and now a disciple of the reverse sear. Follow him to redneck sous vide parties @apkryza.